Next year, Ryanair's boss Michael O’Leary will step back from his current job. He will not step down, but rather step up to the position of group chief executive of Ryanair after the airline will have been restructured. The flamboyant O’Leary has been appointed chief executive officer of Ryanair in 1994. He is an entertaining speaker, but he has made quite a few eyebrow-raising statements. In 2012, Suzy McLeod, her 2 children, and her parents, fly from Bristol, UK to Alicante, Spain. As the trip lasts 15 days, she cannot yet print out the boarding passes for the return flight prior to her departure. In Spain she is staying at a rural villa without internet access, so she cannot print out the passes there either. 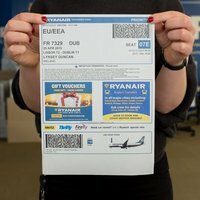 At the airport Ryanair charges €60 per person for printing out a boarding card, so €300 in total. When she calls that unfair on Facebook, O’Leary hits back by calling her stupid. His innovative ideas include increasing revenue by offering standing room in planes, like in a bus rather than seats. He has also suggested introducing fees for using the lavatories in the plane. However, those ideas have never been realized. Watch a video poking fun at Ryanair's excessive nickel-and-diming of passengers. Ryanair's boss also claims that forcing passengers to wear seat belts is useless as they will not save passengers in a crash. "Belts do not matter," he said. "Only authorities who are plonkers insist upon them," O'Leary has been quoted as saying in the British newspaper The Telegraph. Another statement he made is that environmentalists should be shot. In 2006, O'Leary decides to hedge fuel costs at the equivalent of $73 per barrel of oil. But the oil price falls below $61, and Ryanair loses €15 million. O'Leary's response in The Telegraph: "We don't look bright. If we were bright we wouldn't be working for airlines." So he seems to have at least some self-knowledge. But he is fortunate that Ryanair does not charge its boss penalties for very expensive mistakes. It only charges passengers for minor mistakes. Which compensation do EU rules provide in which cases?